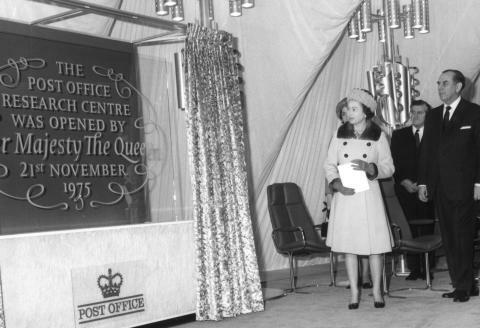 The BT Labs at Adastral Park near Ipswich, Suffolk, today celebrated 40 years at the forefront of telecoms innovation, commemorating the opening of the company’s global R&D headquarters in November 1975 by Her Majesty Queen Elizabeth II. The site, formerly known as the Post Office Research Station Martlesham Heath, was opened on 21st November 1975, as a new centre for telecommunications research, replacing the wartime Dollis Hill research station in North London. In the following 40 years, the BT Labs have been responsible for many of the pioneering innovations which have transformed the communications landscape in the UK and across the world. From developing the first commercial single mode optical fibre link in 1984 to leading the way in live 4K TV broadcasting, BT’s R&D and technology teams –14,000 strong today - have been behind some of the most significant breakthroughs relating to broadband, optical fibre, mobile, network security and TV. The scale of this investment has allowed the BT Labs to spearhead the development of new fibre based technologies which have been deployed across the UK by Openreach, BT’s local access network business. The Labs at Adastral Park are also helping BT to deliver the next exciting phase of its fibre roll-out, by leading on its pioneering trials of “ultrafast” G.fast technology. G.fast is significant because by building on BT’s current Fibre-to-the-Cabinet (FTTC) technology, it allows BT to bring ultrafast speeds to a wide footprint far more rapidly and without the expense and disruption of running fibre directly into a home or business. If the trials prove successful – and if UK regulation continues to encourage investment – the company has pledged to provide speeds of between 300Mbps and 500Mbps to 10m premises by the end of 2020 and aims to reach the majority of the UK by the end of 2025. Looking even further into the future, a possible future iteration of the technology - XG-FAST- has yielded promising results, with initial lab trials showing the technology is capable of delivering speeds of up to 5.6Gbps over copper. By exploring emerging technologies such as this, the BT Labs can ensure that the UK’s digital infrastructure continues to evolve to stay well ahead of customer expectations. Dr Tim Whitley, MD Research & Innovation and Adastral Park, said: “It’s mind-blowing to look back over the past forty years at BT’s record in innovation. And I’d like to thank BT’s incredibly talented pool of scientists and technologists – both past and present – for their efforts in constantly pushing the boundaries. Scientists at BT Labs Martlesham build the first commercial 140Mb/s single mode optical fibre link, building on ground-breaking photonics research carried out on the site in the 1970s and 19980s. Fibre-optic technologies pioneered at Martlesham now form the backbone of all global communications and the internet. Wireless network researchers for BT Cellnet at Adastral Park kick-start the mobile data revolution, making the first live data call over GPRS (General Packet Radio Service). This technology was the precursor to today’s high-speed mobile data services. In 2003 it was our VDSL interoperability testing that helped establish the global standard for the VDSL technology that is powering Openreach’s fibre programme today and other broadband networks around the world. We were one of only two labs in the world responsible for deciding the fundamental coding scheme for VDSL technology. BT wins a Queen’s Award for Enterprise (Innovation), for the creation of IP Exchange (IPX), a service invented at Adastral Park. IPX allows seamless interoperability between fixed, mobile, legacy and next-generation networks, powering the growth of IP services around the globe. Adastral Park stays at the forefront of fibre-optic research, as researchers achieve world record-breaking 3Tb/s speeds over real-world optical fibre between Adastral Park and the BT Tower in London. That is enough capacity to download roughly 100 HD movies every second. This research will help to keep BT’s networks ahead of bandwidth demands well into the next decade. Scientists from Toshiba Research Europe and BT Labs Adastral Park use ‘quantum key distribution’ (QKD) to securely encrypt a 200Gbps single fibre over 100km. This technique offers ground-breaking levels of security on fibre-optic networks by using the fundamental properties of physics, transmitting data ‘keys’ securely using single photons of light. Adastral Park is now home to more than 70 technology companies, from large global players to small start-ups, and forms one of the most important clusters of telecoms innovation world-wide, co-ordinated by Innovation Martlesham, the park’s technology incubator scheme. Around 4000 scientists, IT experts and engineers work on the 100-acre campus, which was previously an RAF airfield and home to the Aeroplane & Armament Experimental Station in the inter-war period, testing many of the aircraft which were later used in World War 2. 1Comparison based on total R&D spend over 2004/5 to 2013/2014. Data taken from EU Industrial R&D Investment Scoreboard. 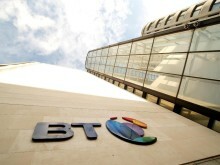 For the year ended 31 March 2015, BT Group’s reported revenue was £17,979m with reported profit before taxation of £2,645m.